The GE9X will be the most fuel-efficient engine GE has ever produced on a per-pounds-of-thrust basis, and is designed to achieve a 10% improved aircraft fuel burn versus the GE90-115B-powered 777-300ER. A video introduction to the GE9X engine. The GE9X front fan will be the largest of any GE engine at 132 inches in diameter and includes a durable, lightweight composite fan case similar to the fan case on the GEnx engine. Compared to a metal fan case, the composite fan case will lower the weight by 350 lbs per engine. The GE9X fan blade will feature new high-strength carbon fibre material and a steel alloy leading edge. "The GE9X fan blade will feature new high-strength carbon fibre material and a steel alloy leading edge," says Bill Millhaem, general manager of the GE90 Program at GE Aviation. "This new material, along with a higher fan tip speed, will improve the efficiency of the low-pressure turbine (LPT) and deliver more than 1.5% fuel efficiency improvement compared to the GE90-115B engine." The fan blades in the GE9X engine will be fourth-generation composite fan blades. GE Aviation developed the first composite fan blade for its GE90-94B engine in 1995. Composite fan blades are also featured in the GE90-115B and GEnx engines. GE has accumulated 36 million flight-hours with composite blades and anticipates accumulating more than 100 million flight-hours when the GE9X enters service later this decade. The GE9X engine will have 16 fan blades, which is fewer blades than the GEnx and the GE90-115B engines. This fan blade reduction is possible as a result of advancements in three-dimensional (3D) swept design that enables engineers to create a more swept design and large fan chord. The new high-strength carbon fibre material allows the blades to be thinner than blades made from current carbon fibre material, with the same strength and durability. These improvements will drive fuel efficiency improvements and hundreds of pounds of weight reduction from fan blades and the structure needed to support them. The lower blade count and new carbon fibre composite material will enable GE to increase the fan tip speed. The increased tip speed will improve the efficiency of the LPT, enabling a reduction in the LPT blade count and contributing to the engine's fuel burn improvement. The GE9X follows the successful GE90-115B engine that entered service in 2004. Rated at 115,000 lbs of thrust, the GE90-115B engine includes such performance-enhancing features as a 3-D aero compressor and wide-chord, swept composite fan blades for greater efficiency. The dual annular combustor emits no more than 40% of the hydrocarbons allowed by today's international standards. In addition, today's GE90-115B engines have been enhanced to reduce fuel burn by 3.6% from the 2000 launch specification. More than 1500 GE90-115B engines have been ordered by customers for their Boeing 777-300ERs, 777-200LRs and 777 Freighters. In 2011, the GE90 engine experienced its most successful order year and accumulated airline and freighter operator commitments for 400 engines, surpassing the 250 engine commitments record from 2007. Snecma of France and IHI Corporation of Japan are revenue-sharing participants in the GE90 programme. The GE9X engine for Boeing's 777X aircraft will be in the 100,000 lbs thrust class with a 10% improvement in fuel burn over today's GE90-115B. 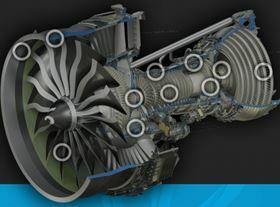 Key features include: a 132" fan diameter; composite fan case and fourth-generation composite fan blades; next-generation 27:1 pressure ratio high-pressure compressor; a third-generation TAPS (twin annular pre-swirl) combustor for greater efficiency and low emissions; and ceramic matrix composite (CMC) material in the combustor and turbine. GE Aviation has been conducting tests on new materials and technologies for the engine during the last few years. Along with fan blade tests at the ITP Engine testing facility in the UK, GE will test a high-pressure compressor rig at GE's Oil & Gas facility in Massa, Italy, in August. The first engine will test in 2016, with flight-testing on GE's flying testbed anticipated in 2017. Composites get in deep with new-generation engine.